Subscribe here to receive future copies of this newsletter by email. This is a (roughly) weekly newsletter experiment containing links to things I’ve written and made, plus links to other interesting articles, reports and essays I’ve come across. I’m going to experiment with different sections until I figure out what works best. Because this is the first Review, I’ve included things I’ve made and written over the past month or so. In the future, there will be greater focus on things I’ve written most recently and essays, articles and other things I found within the past week or so. “An Insiders Look Into the Life Science Boom“ (Mattermark) – I pull back the curtain on the boom in life sciences boom and examine the driving forces behind it with help from life sciences investors Romy Seth, Brad Loncar, and Ryan Bethencourt. Thanks once again to Adam Singer for facilitating introductions and reposting the article on his blog, The Future Buzz. “Where to Raise Money This Year (And Where You Should Have Raised Money Last Year)“ (Mattermark) – I analyzed early stage deal data from eighteen US cities to find that VC investment has decreased significantly for companies based in San Francisco, Seattle, New York, Chicago and many other major startup hubs between Q1 2015 and Q1 of 2016. However, biotech hubs like San Diego and Boston, as well as “emerging” markets like Detroit, Portland, OR and St. Louis are performing well. “Do Too Many VCs Spoil the Startup?“ (Mattermark) – Some scholars of social networks would suggest that a startup may grow faster if it has lots of investors, because those investors presumably have lots of connections for a company to take advantage of. Others may suggest that too many VCs would give good, but competing advice, thus hampering a startup’s success. I find that the breadth of a startup’s investment syndicate has no significant correlation to the speed with which they can raise subsequent rounds. Other factors must be at play. “Questions for Blockchain Experts“ (jasondrowley.com) – I was asked to help an investor friend come up with questions for a podcast episode on which he’d be interviewing a blockchain expert about the viability of VCs and angels investing in blockchain tech. Due to a scheduling snafu, my questions weren’t used, but I thought it was worth sharing what I would have asked if I was on his side of the microphone. March and April were very prolific times for my graphic design hobby. Like always, I posted my work to my profile on The Noun Project for others to purchase or use under CC 3.0. Thanks to a request from UChicago, I made a suite of icons representing concepts and tools used in autopsies, including this bone saw and the death certificate below. On a less morbid note, and to celebrate the fact that I finally graduated from undergrad, I used the visual language of the death certificate icon to make a diploma. 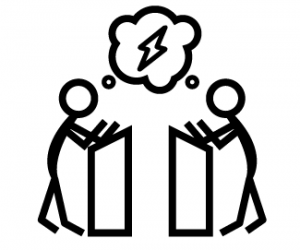 Also, during the Brooklyn Democratic debate I got kind of bored and made this icon representing Debate.